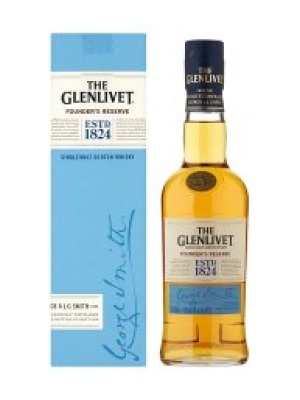 The Glenlivet Founder's Reserve Single Malt is a popular Whisky available from Tesco Groceries in 35cl to buy online. Visit Tesco Groceries for the best price for 35cl of The Glenlivet Founder's Reserve Single Malt or compare prices on our other Whisky products. Founder's Reserve Single Malt Scotch Whisky. George Smith, the founder of the Glenlivet distillery, in 1824, was the first to produce a whisky of such exceptional quality that it was soon widely acknowledge to be how a malt whisky should taste and rightfully earned the name 'The Glenlivet''. The Glenlivet founder's reserve brings new life to the time-honoured and celebrated style of the Glenlivet. At the heart of the Glenlivet style is its classic fruitiness, the result of the unique, wide, lantern-shaped stills favoured by George Smith. For the Glenlivet founder's reserve, this fruitiness, is brilliantly complemented by selective use of American first fill casks, creating a malt of exceptional smoothness, the very quality for which George Smith's the Glenlivet was widely admired and appreciated in his day. In 1824, George Smith established his distillery in the remote and wild location of Glenlivet. Here, he found the perfect conditions to craft the definitive single malt whisky. Through this timeless, primeval valley run the icy waters of the river Livet. Its name, ''smooth flowing one'' in Gaelic, reflects the Glenlivet's beautifully rich and elegant flavours. Where to buy The Glenlivet Founder's Reserve Single Malt ? The Glenlivet Founder's Reserve Single Malt Supermarkets & Stockists. You can buy The Glenlivet Founder's Reserve Single Malt online in most retailers and find it in the Whisky aisle in supermarkets but we found the best deals online for The Glenlivet Founder's Reserve Single Malt in Tesco Groceries, Waitrose Cellar, and others. Compare the current price of The Glenlivet Founder's Reserve Single Malt in 35cl size in the table of offers below. Simply click on the button to order The Glenlivet Founder's Reserve Single Malt online now.